From window treatments to blinds, shades, shutters, draperies, cornices, valances, and more, Sarah Blackwell Window Treatments does it all. Whether you have a specific idea in mind or need some professional guidance to finish off your windows, we can help. If your interest is in swags, jabots, or draperies, we can create the look for you. Or, search our selection of blinds, shades, or shutters, as we carry lines from many manufacturers, including the highly-recommended Hunter Douglas. Whatever you’re looking for, we can make your dream a reality. Sarah will personally come to your home or business to discuss your options and take measurements. Once you’re satisfied with your design, she’ll return to install them. It doesn’t get any easier than that. 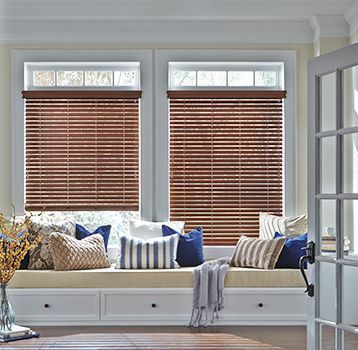 No matter if your budget is big or small, Sarah is sure to have the window treatment that’s ideal for your home. Every custom slipcover is an original design, which means it’s unique to your home. We can create a new look to restore any chair, sofa, or sleeper sofa to your satisfaction. All you have to do is bring in the fabric that you’d like to use and Sarah will take it from there. She can even help you choose the best fabric for your situation, and take proper measurements of your piece. With your new slipcover, you’ll never have to hire professional furniture cleaners to come to your home again! Instead, you only have to remove the slipcover and take it to the dry cleaners to freshen your home. From dust ruffles to pillow shams, bed coverings, and headboards, let Sarah transform your bedroom into the sanctuary of your dreams. Have you ever wanted to have everything in your bedroom match exactly? We often make bedroom sets for our clients. These sets include a bedspread, matching dust ruffles, pillowcases, and shams for a complete look. To really make a statement, we can even match the window treatments! If you’re just looking to update your space, we have fabric choices and styles perfect for every season. Whatever your budget and whatever your needs, Sarah Blackwell Window Treatments is ready to transform your home into the designer house of your dreams. Sarah holds regular weekend slipcover seminars to teach you how to complete your next fabric project on your own. Discover the joy of doing it yourself with step-by-step instructions from an expert. Registration includes accommodations at a convenient location, snacks, and step by step instructions to make your own slipcover. Please call 508-255-6221 for details and scheduling. If I don’t have it listed, there is a very good chance I still do it.